I'm in the homestretch for finishing the farm quilt and then....rip it, rip it. I was free motion quilting my wonderful feathers around one of the corners and I was halfway done and compared it to the opposite corner. Then I remembered that I was supposed to rip out the spine in that spot before I feathered it, as I had changed the spine on the other corner. The spine was to be on the faint line shown by the arrow. I had once thought that I'd use the blasted seam ripper less as I got better at quilting, but it seems I use it just as much. Some days it feels like I use it more than before! Why do we do this to ourselves!!!!!?????!!!!!!!! Total empathy!!!!!!! We all feel your pain. Sorry for your! Buth the ripper ... ir our best friend! Lol! A hug! Sometimes that is my best friend! There are times we all have to rip it. 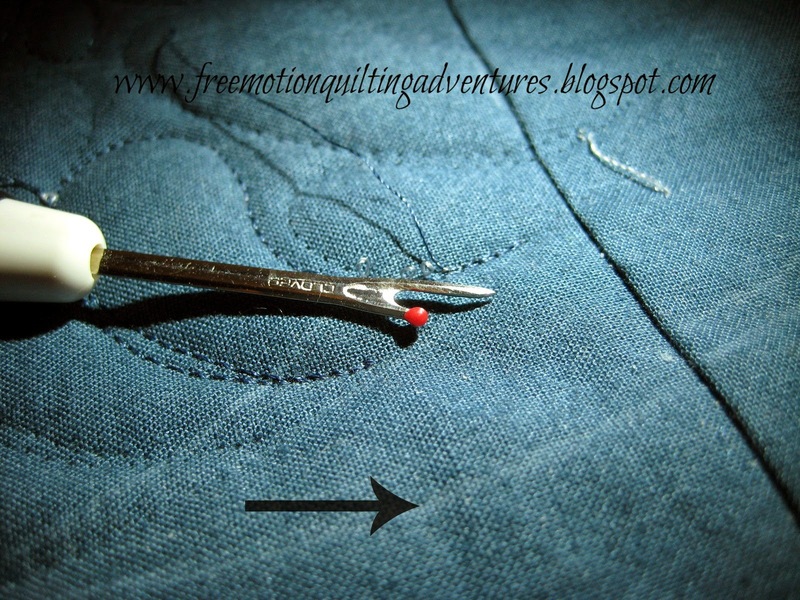 I have come to think that using the seam ripper is a sign I'm getting better at whatever I'm doing. It's a sign that I think I can do better and make it right. (Greater confidence.) So rip away! I love seeing your work. It inspires me. But there's a difference in this ripping --- it's not because the stitching itself is bad but because you needed to change the design. I know for me that's a big change from the kind of ripping I did when I started FMQing.